ENERGY, Science, Technology, Environment and Climate Change Minister Yeo Bee Yin is envisioning a more efficient market in Malaysia’s power sector. Her plan? “[I am looking at] more competition across the value chain. You have generation, transmission and distribution,” Yeo tells The Edge. But while independent power producers (IPPs) have participated in the generation segment since 1993, competition is not yet permitted in the other two segments. National utility company Tenaga Nasional Bhd (TNB) remains the owner and operator of Malaysia’s 22,840km-long electricity transmission and distribution lines. It is also the single buyer for all electricity produced in the country. Recall that in 2013, IPPs cried foul that TNB had an unfair advantage in competitive biddings for new power projects on the grounds that the utility giant could offer lower bids and make up for the lower yield with income from the networks. Thus, it is hard to imagine a level playing field in the industry without a restructuring of TNB. When asked whether TNB’s monopoly in those segments will be broken, Yeo was tight-lipped. “An announcement will be made in the middle of next year at the latest. “We are talking about a reform that will give an implication in many, many years to come. I do not want to jump the gun by telling a little but not everything. I think uncertainty is not good for anyone,” she says tactfully. But if the government’s recent actions are any indication, one could look at its Budget 2019 proposal to “privatise infrastructure assets”, beginning with the setting up of the world’s first airport real estate investment trust. Similarly, TNB can inject either its transmission or distribution assets, or both, into a separate entity, which will, in turn, unlock the value of the assets — perhaps via an initial public offering for surely up to billions of ringgit in proceeds. Carving the assets from TNB could provide an assurance that future developments, such as smart grids, will be effectively utilised without favour. The company may still keep a smaller stake in the two segments. Investors, including other IPPs, could also have the opportunity to participate in what is already known to provide steady and stable recurring income. TNB could utilise the proceeds to reward its shareholders via dividends, such as its 28.81%-shareholder national sovereign fund Khazanah Nasional Bhd. It could also use the proceeds to expand its operations, which currently span Europe, the Middle East and parts of Asia — in exchange for the lower income from Malaysia where over 92% of its revenue comes from. Existing mechanisms such as the base tariff and imbalance cost pass-through (ICPT) could facilitate the opening up of the network segment, says the analyst. 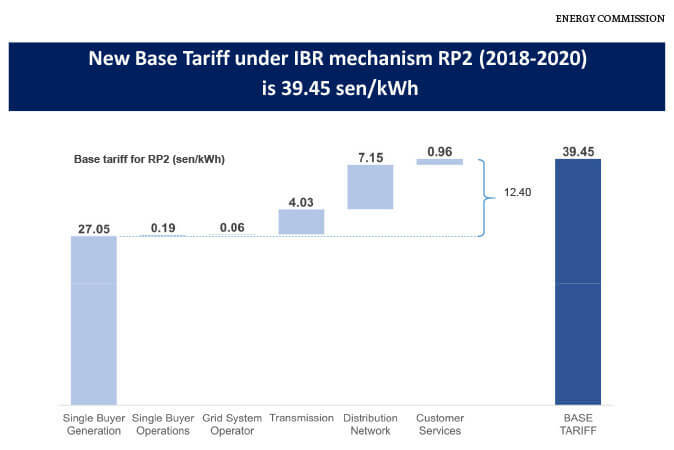 From the 2018-2020 base tariff of 39.45 sen, 11.18 sen or 28.34% is for TNB’s transmission (4.03 sen) and distribution (7.15 sen) network, according to the Energy Commission. The analyst also cites Malakoff Corp Bhd’s exclusive rights to distribute up to 100mw within KL Sentral as an example of how other players can come in. While Yeo is reluctant to share the details about the impending industry reform, she does say this: “In Malaysia, there will be more competition for TNB. In the immediate term, there is concern over the impending announcement of the ICPT for 1H2019 amid high coal prices. While the ringgit has gradually weakened against the US dollar since last April, the price of Australian thermal coal has remained at over US$100 per tonne. The average coal price in TNB’s second quarter ended June 30, 2018 (2QFY2018), was US$91.10 per tonne, an increase from its FY2017 average of US$72.70 per tonne. It expects to procure 30.7 million tonnes this year. Some analysts referred to the previous 2H2018 ICPT announcement as indicative of the government’s commitment to the mechanism. They say 52% of TNB’s 8.4 million local customers use below 300kWh a month and will not be affected. ICPT for 2H2018 entails a 1.35 sen/kWh surcharge for consumption above 300kWh. But the surcharge for 81.7% of domestic customers is subsidised by the Kumpulan Wang Industri Elektrik (KWIE) fund, totalling RM114 million. Yeo concedes that “we are suffering” from unpredictable coal prices, but avoids answering conclusively when asked whether the government is committed to allow the tariff to be dictated by the ICPT mechanism. “We will announce the surcharge or rebate in mid-December,” she says. In first half of 2018 (1HFY2018), TNB made a net profit of RM3.36 billion or 59.2 sen per share on the back of RM24.77 billion in revenue. It has proposed a dividend of 30.27 sen per share. Among investors, TNB is still considered attractive. Bloomberg data shows that between Aug 30 and Nov 16, the counter had 13 “buy”, five “hold” and two “underperform” calls with target prices ranging from RM14.40 to RM18.70. It is among the FBM KLCI component stocks that have this many “buy” calls. The stock closed at RM14.80 last Friday, giving the company a market capitalisation of RM84.04 billion, and pointing to minimal downside at present. MIDF analyst Hafriz Hezry highlights TNB’s cheap valuation of 12 times price-earnings ratio, potential dividend upside, possible monetisation of its fibre network assets and the utility giant possibly benefiting from the new solar leasing mechanism as positives for the group. TNB’s wholly-owned subsidiary, Gsparx Sdn Bhd, will be offering financing for solar self-generation packages under the net energy metering programme. TNB was previously a bidder for solar projects as well. “RE (renewable energy) is just another greener form of generation. Everyone has the opportunity to pursue this (RE generation), including TNB,” Hafriz says. In the big picture, analysts do not expect TNB’s middleman role or single buyer status to change anytime soon. But TNB could do well by working on improving its efficiency further and being prepared for stiffer competition on all fronts.